Flame arresters comprise a diverse array of safety devices, ranging from small, end-of-line units with threaded connections to massive, custom-built flanged behemoths weighing several tons. This month's Back to Basics article covers the basics of flame arresters to help prevent misapplications, which can have catastrophic results. 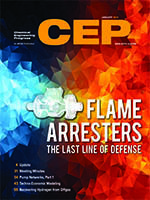 Other topics in this issue include meeting minutes, pumps, techno-economic modeling and recovering hydrogen from offgas. Countless articles and books give advice on meetings: Define the purpose. Create an agenda. Invite the right people. Be prepared. Start and end on time. Stay on topic. Put away the electronic devices. These basic rules of etiquette are simple, but when they are not followed, a meeting can turn counterproductive. Here are some tips to make your meetings more effective. Flame arresters are designed to prevent catastrophe. How do they work, and which type is right for your application? Distribute minutes for project team meetings to ensure the scope is recorded and communicated. Use the format outlined here to get all the benefits of minutes without the drawbacks. This article demonstrates how to construct a pump’s system curve and explains the four most common mistakes encountered when operating centrifugal pump networks. Spreadsheet software can be used to build integrated process and economic models that provide new insights into profitability. As demand for industrial-grade hydrogen increases, more facilities are recovering H2 from offgas and selling it. Several recovery technologies are available, each with its own strengths and limitations.